Police detective Columbo (Peter Falk) is an unlikely crime solver. He dresses in a shabby suit and raincoat, drives a beat-up old car and often appears absent-minded and slow-witted. Through this persona, crime suspects are often tricked into revealing too much and are tripped up by seemingly unimportant inconsistencies in their alibis. 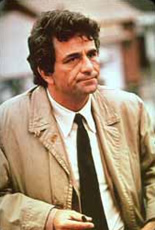 The series popularized the “inverted detective story” format in which the viewer is first shown the crime and then watches Columbo find the guilty party. Ah, just one more question. Please!